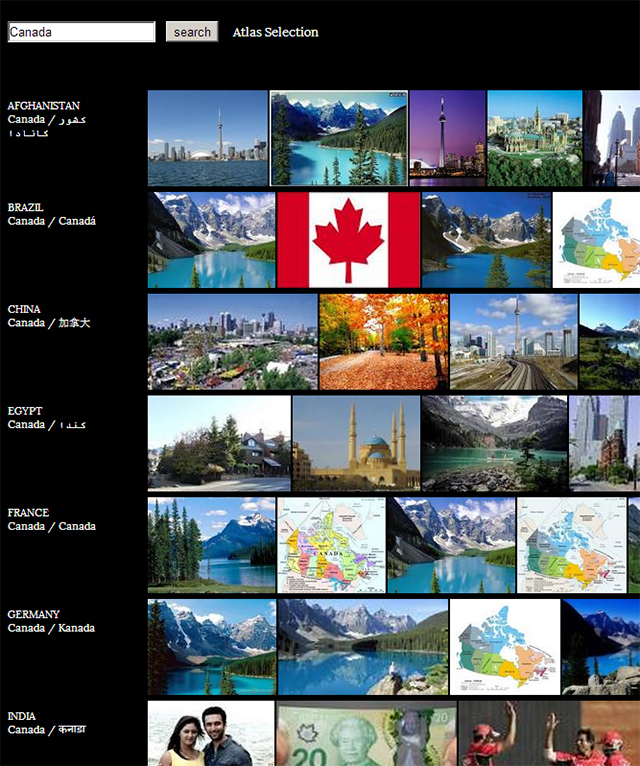 Search results for Canada in the Image Atlas. Image Atlas investigates cultural differences and similarities by indexing top image results for given search terms across local engines throughout the world. Visitors can refine or expand their comparisons from the 57 countries currently available, and sort by Gross Domestic Product (GDP) or alphabetical order. I searched for Canada, and it’s quite interesting to see how it is perceived around the world. Of course, the Toronto skyline and the Rocky Mountains are everywhere, and God knows that Canada is way more than that. It’s fascinating to find a mosque in Egypt or an Indian couple, a 20 dollar bill and a cricket picture in India as a top result. Please let me know if you try a term and what results did you got.